Check the video and the links shared below to know the fact. Link: मप्र: सेंधवा में दिल दहला देने वाली घटना: एक ही परिवार के पांच बच्चों के कुएं में मिले शव, माता-पिता फर. After investigation, according to police, Bhatar Singh, father of the children told that he himself murdered his own children due to the tensions in family. Such rumors scare us. That’s because we don’t know the truth behind them. We need to check these kind of audio, video and images before we pass it on further to scare others. This is a true image with absolute fake audio message claiming about the children murdered for organ harvesting. 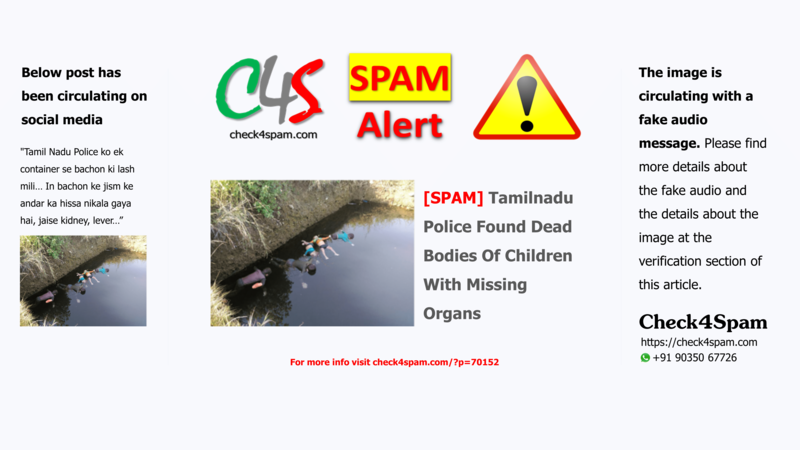 The image is from Sendhwa Madhya Pradesh, and the audio message says that Tamilnadu police found these bodies from containers and the organs from bodies were missing. The person in audio also uses abusive language to provoke others. This is totally misleading the public. In fact this is an image from an unfortunate incident happened at Chikhali village, Sendhwa, Madhya Pradesh, where the children were killed by their own father due to family dispute. Please also note there was an old similar fake which was in circulation.